Boise State's Justinian Jessup attempts a shot over UNLV's Kris Clyburn Sat. March 2, 2019, at Thomas & Mack Center in Las Vegas, NV. UNLV won 85-81 in overtime. Even the most optimistic Boise State fans had to have a sinking feeling during the Broncos’ game at UNLV Saturday night. Justinian Jessup delayed the inevitable, but the inevitable happened. BOISE, Idaho — Monday, March 4, 2019. 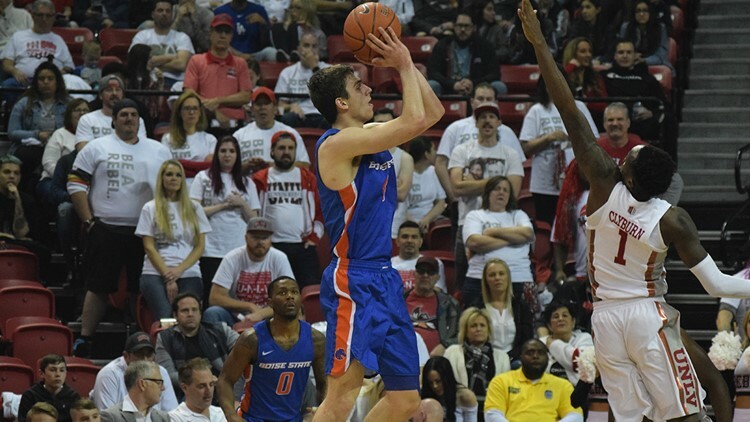 Did Boise State players go into “here we go again” mode Saturday night at UNLV? The Broncos led by as many as 14 points in the first half and 11 in the second, but the Rebels stormed back to take the lead each time. Boise State had a four-point lead with three minutes left but couldn’t hold it. However, Justinian Jessup hit a jumper with one second left to send the game to overtime—maybe this time something would go the Broncos’ way. It was then that the old familiar swoon set in thanks to a couple defensive lapses, and the Rebels won 85-81. “Part of it’s not being able to get a stop there at the end of the game,” said coach Leon Rice. The other part was rebounding, as UNLV had a 39-24 advantage on the glass. And that leaves Boise State with a 1-8 record in one-possession games in regulation. Boise State played well enough to win. (Where have we heard that before?) The Broncos shot 50 percent from the field, 44 percent from beyond the arc and 87 percent from the free throw line—and they turned the ball over only nine times. It was defense that let them down one too many times. But this team left it all out on the floor. Derrick Alston was doubtful until gametime with a painfully bruised big toe. Rice pulled him from the shootaround Saturday to try to preserve him for the game. Then Alston came off the bench and scored 21 points. Nevertheless, Boise State is dealing with its first five-game losing streak since its inaugural season in the Mountain West seven years ago. Not much from the Boise State women’s 53-38 win over UNLV Saturday will make the season highlight reel (unless it’s all defense). The Broncos and the Rebels both shot just 26 percent from the field, but Boise State got more chances by forcing 21 turnovers. The Broncos also held UNLV to zero three-pointers. They’ll have to be a lot cleaner tonight, as they host New Mexico in the home finale at Taco Bell Arena. The Lobos trail Boise State by one game in the Mountain West. The Broncos will have to quickly put aside the emotions of Senior Night for Marta Hermida and Joyce Harrell and put everything they have into this one. If they win, they clinch the conference regular season championship and the No. 1 seed next week at the Mountain West Tournament in Las Vegas. Brett Rypien’s numbers at the NFL Combine were right in line with projections that have him going from rounds 4-7 in the NFL Draft. The former Boise State standout’s results ranged from a tie for 13th (out of 15 quarterbacks) in the 40-yard dash at 4.91 seconds to fourth out of 14 in the broad jump at 116 inches. That latter figure will come in handy on a fourth-and-three, I guess. The main buzz surrounding Rypien at Indianapolis was that he had an informal meeting with Denver offensive coordinator Rich Scangarello, according to KUSA-TV. That’s presumably separate from the team interviews conducted with all the Combine invitees. Fellow Boise State product Alexander Mattison also appeared to post numbers akin to a player who would also go on Day 3 next month. How will the NFL personnel people judge Mattison’s 4.67-second clocking in the 40, which was 20th among the 23 running backs at the Combine? Maybe the 10 additional pounds of muscle he put on during pre-Combine training was a factor. But there was a viral photo a few weeks ago of a chiseled Mattison standing next to the larger and even more chiseled DK Metcalf, the wide receiver from Ole Miss. Metcalf, who measured in at 6-3, 228 pounds, looked cartoonishly strong. Then he ran a freakazoid 4.33 in the 40. Mattison’s tale will be told not in his 40 time, but in his intangibles as a quality running back. We’ll see how far that takes him. Boise State spring football continues with a morning practice today—more reps for true freshmen quarterbacks Hank Bachmeier and Kaiden Bennett. Everybody’s anxious to see how the QB competition shakes out between now and August 31, but in his press conference Friday, coach Bryan Harsin tried to rein in early expectations on the newly-arrived duo. “It’ll be really exciting when they make a play,” Harsin said. “Then you’re going to see some things that a senior quarterback wouldn’t do. There’s just going to be some of those things you have to accept at times and immediately correct.” And here we go, forgetting that Jaylon Henderson and Riley Smith are part of spring ball, too. A FACILITY THAT FITS FOR THE AZTECS? When Boise State next travels to San Diego State in 2021, the Broncos may play yet again at SDCCU Stadium (formerly Qualcomm). Or it could be Petco Park. But there’s a light at the end of the tunnel for the Aztecs, if they can find the money. SDSU has awarded a $250 million contract to Clark Construction to build a new expandable 35,000-seat stadium on the Qualcomm site in Mission Valley. The venue would also be suitable for pro soccer. The goal is to have it ready for San Diego State’s 2022 football season. Now the university has to raise enough funds to cover an estimated annual debt payment of $18 million. The weekend started just dandy for the Idaho Steelheads at Kansas City—a 4-1 win Friday night that featured three third-period goals and a 29-save performance by goalie Tomas Sholl. It ended with a 2-1 loss to the Mavericks Saturday night on a short-handed goal with eight minutes left in the game. That spoiled a solid night between the pipes for Colton Point, who made 33 saves. The Steelheads dropped two of three in KC and are now in a tie for first place in the ECHL Mountain Division with Tulsa. The Utah Grizzlies lurk one point back. The Boise State women’s gymnastics team topped 197 again Friday night, scoring 197.125 to defeat No. 17 Washington and Utah State in Taco Bell Arena. The No. 13 Broncos recorded the highest score on bars in school history, a 49.575, and junior Courtney McGregor, the 2016 New Zealand Olympian, tied the school individual record at 9.775. Also, the Northwest Nazarene men’s basketball team fell 87-82 Saturday night at Seattle Pacific and will be seeded third at the GNAC Tournament in Bellingham, WA. The Nighthawks will face sixth-seeded Simon Fraser Thursday evening. The NNU women finished the regular season with a 98-58 rout of Alaska in Fairbanks and, as the tournament’s No. 2 seed, have a bye into the semifinals on Friday. The Nighthawks are 26-2. Legendary Green Bay quarterback Brett Favre announces his retirement after 17 NFL seasons. Seriously. Favre had just completed one of his best seasons in a career that included two Super Bowls and NFL records for passing yards, touchdown passes, wins, and—most impressively—275 consecutive starts. Favre, of course, would reneg and play one final season with the New York Jets in 2008. And then he’d reneg again and play two more final seasons with the Minnesota Vikings. Former Boise State star Korey Hall had started at fullback in his rookie season alongside Favre, and BSU alum Daryn Colledge was a Packers offensive line starter during Favre’s final two campaigns in Green Bay.